Rated 4.8 out of 5 stars.257 total votes. 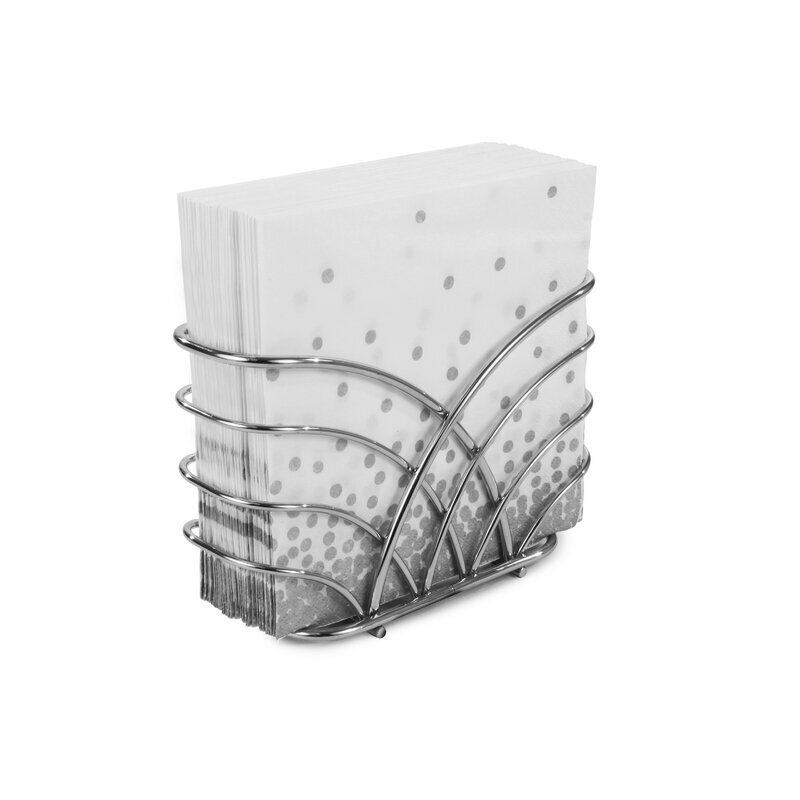 Keep your napkins at the ready on the counter or dining table with this stylish steel holder, featuring a sleek chrome finish. Offering high-quality basics, that are anything but, Rebrilliant is the answer to all of your organization and design needs. From the simplest bathroom update to a complete home overhaul, this is where style and function intersect to create the ultimate collection in home foundations. When you buy a Rebrilliant Napkin Holder online from Wayfair, we make it as easy as possible for you to find out when your product will be delivered. Read customer reviews and common Questions and Answers for Rebrilliant Part #: REBR1392 on this page. If you have any questions about your purchase or any other product for sale, our customer service representatives are available to help. Whether you just want to buy a Rebrilliant Napkin Holder or shop for your entire home, Wayfair has a zillion things home. Very, very nice. This holder is durable and attractive. We’ve preferred it over the various ceramic types. I purchased s/p shakers to compliment and we’re still delighted with the look together. Value and quality here. Since I went to a smaller table I decided I needed a napkin holder that did not take up as much room. This is a great size for 6 1/2 x 6 1/2 napkins. This is perfect. I love it as it keeps all the napkins from falling out. This hold regular napkins you would find at the super market. Great napkin holder. Napkins no longer flop down. They stay upright! Wider then I thought and works perfectly in my new apartment! It fits the napkins and holds them straight. Love it!! This was a Christmas gift for my son. He loved it! Rated 5 out of 5 stars.198 total votes. Keep your napkins dry and organized in style with this flat napkin holder. Made from steel, it features a chrome finish that blends effortlessly with contemporary and transitional kitchen decor. Showcasing half circles on all four sides, it has a curved arm that reaches to the center to hold standard size napkins in place whether you're inside or out. Upkeep is easy: simply wipe with a damp cloth and towel dry. Rated 5 out of 5 stars.45 total votes. Keep a stack of napkins at-the-ready on the kitchen counter or dining table with this convenient holder. Rated 5 out of 5 stars.61 total votes. Upgrade and give your tablescape a refined polished look by adding a napkin holder to your table. Save yourself the hassle of getting up from a meal, multiple times, to grab a napkin or tissue for your family or guests, by keeping this holder nearby. 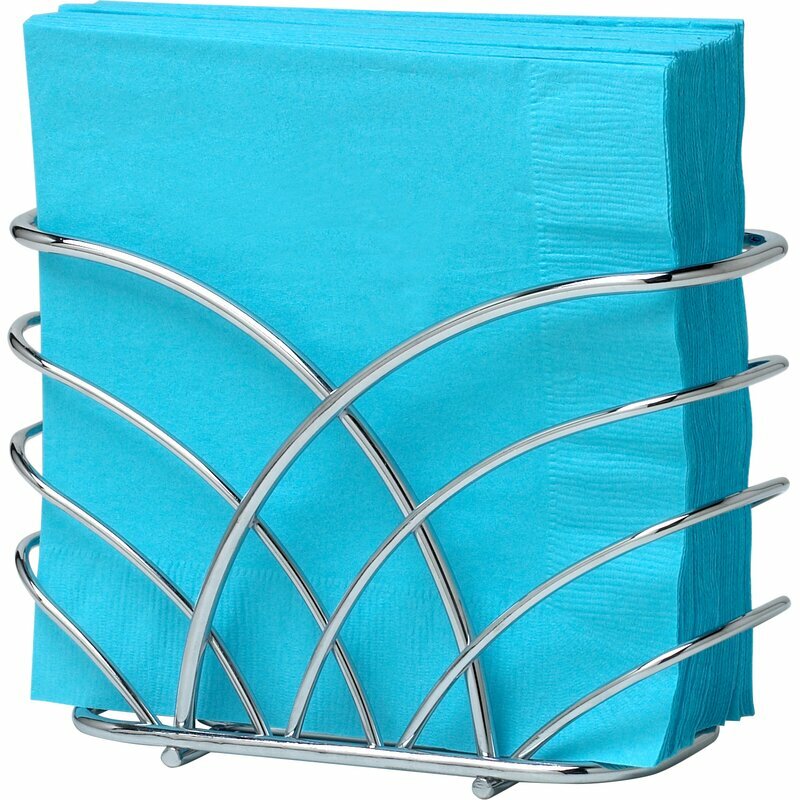 Crafted from metal, in a metallic finish, this piece measures 2.5'' H x 5.75'' W x 5.75'' D. It accommodates two packs of 20 count folded napkins. Rated 5 out of 5 stars.15 total votes. Give napkins a stylish storage place in your kitchen or dining room. The item holds napkins upright so they remain organized and easily accessible. Great for entertaining or everyday use. The bold uniform pattern adds an interesting design detail that pairs well with simple and sleek style decor. Made of sturdy steel. Rated 4 out of 5 stars.25 total votes. Add a great centerpiece to your kitchen or dining room table with the decorative Rebrilliant napkin holder with walnut base. This napkin holder keeps your napkins off the table and easily accessible. This piece features a loop for easy carrying, while a padded base protects surfaces from scratches. Made of rustic wood and sturdy steel, its handsome design will add a sophisticated touch to your home. This napkin holder is a great way to display napkins with a modern twist. It goes perfectly on any buffet table for a party or catering event.